Weight at Rescue: 13 lbs. 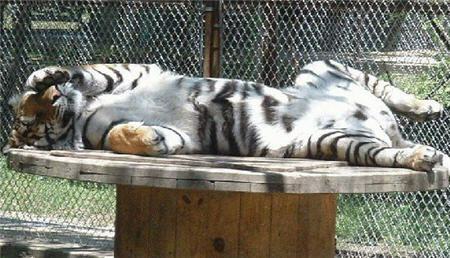 Mohan is one of 8 tiger cubs we rescued in 2000 from an inhumane Texas breeding mill. He was severely malnourished and infested with ringworm, mange, and impetigo. 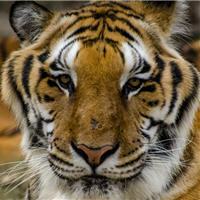 After eight weeks of treatment, Mohan regained his strength and is now a happy, healthy Siberian Tiger. He loves the females he lives with and feels a responsibility to look after and protect them. His favorite pastime is eating, and he looks forward to every meal and snack. Often times when food is being distributed, Mohan will sit up on his haunches with his front paws on the fence groaning for his share. We’ve nicknamed him Hoover since he inhales his food. He loves getting new toys, especially buckets and barrels. When he was younger, he would steal our tools earning him the nickname Tim after Tim the Tool Man. When Mohan is on the playground, you’ll often find him lazily lounging on his back on top of the den or wooden spool with his front paw draped over his eyes. Although his size can be intimidating, Mohan actually has a very sweet disposition and is easily spooked by large groups of people or things he finds to be out of the ordinary. 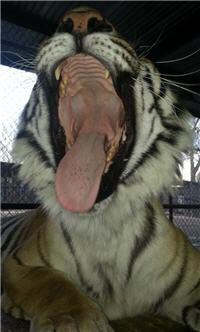 He loves it when volunteers talk to him and will moan and groan with pleasure, especially at feeding time.